Battle of the iBands iPad music lesson. Demonstrate your skill by performing in a battle of the iBands. A contemporary take on a traditional battle of the bands. Whole class iPad music lesson. Watch as your students create an iBand, a small ensemble made of software instruments. Construct melodies, craft rhythms and finally take part in an iBand battle. Utilise the amazing Jamhub to create silent bands in your classroom. A room full of iPad bands creating original music in silence is a quintessential music technology experience. 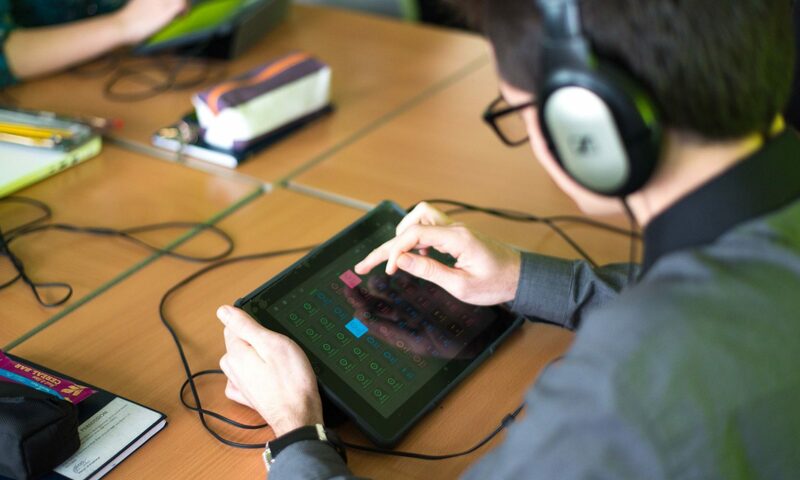 iPads in the music classroom like you’ve never seen before. Improvise and compose music for a range of purposes using the inter-related dimensions of music. Evaluate song form, melody and rhythmic structure. Organise your ensemble and construct your own unique arrangement. A project that focuses on teamwork, critical thinking, and musicianship. Appreciate a wide range of high-quality music performances as your class demonstrate how to make and play music on the iPad using the finest iOS software instrument. Music Hands provide all the equipment and resources required to deliver a high-quality experience for staff and students. Read our testimonial reviews as evidence of the character of our service!